Okay so before I moved to Saudi Arabia I had heard people talk about how cheap it was, but I wasn’t expecting it to be so cheap. I am originally from West Virginia, and always felt like the cost of living there was pretty cheap. Then I paid $1.82 for a bottle of water, bottle of apple juice, and a chicken sandwich. Yesterday I went into the city for the first time, and went shopping at a place called Al Othaim mall. While there I bought some necessary supplies for work, home, and groceries. I managed to get almost everything I needed for under $100 usd. This is everything I purchased on the shopping trip yesterday. I was able to purchase a lot, but still I need a lot more to get settled. Our company has a bus that goes to the city 4 times a week, and our compound has a separate bus that goes every day but one. I will update with any future hauls. One really neat thing that did happen while we were shopping, however. My coworker and I were wanting to go upstairs in the mall to access the food court, yet I couldn’t take my full shopping cart up the escalator, and the elevator had a long wait. My coworker told me that it was fine to leave my cart full of merchandise downstairs while I went upstairs, as this is one of the safest countries with one of, if not the lowest rate of theft. After having my car broken into and having things stolen in the past in USA, it really is comforting to feel safe here. That’s good, but still not that cheap ! 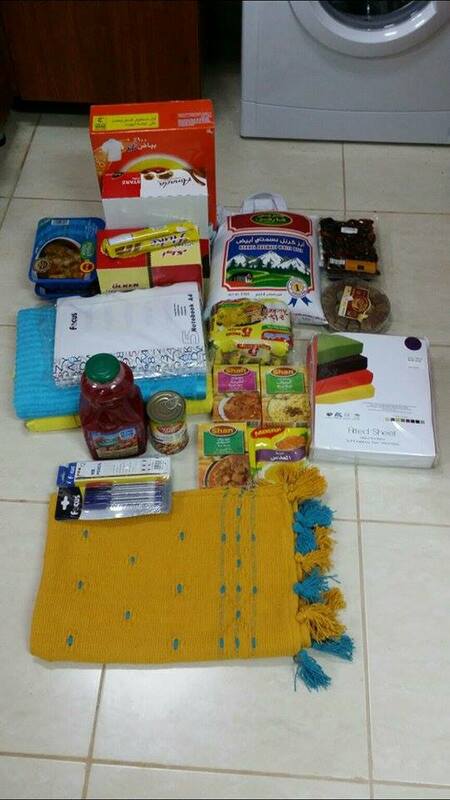 here in Jeddah I can get all of that with about 200 Saudi Riyals about 60 dollars ! for the safety side, that’s completely true, you will not believe that some thieves here don’t steal or touch women as it’s part of their “kind of” ethics (i am not kidding) !